In light of national events that have brought increased attention to the issue of water quality, the City of Chicago announced several additional precautionary measures that will be added to the City’s water testing protocol, continuing the City’s track record of exceeding current state and federal regulations as well as industry standards. 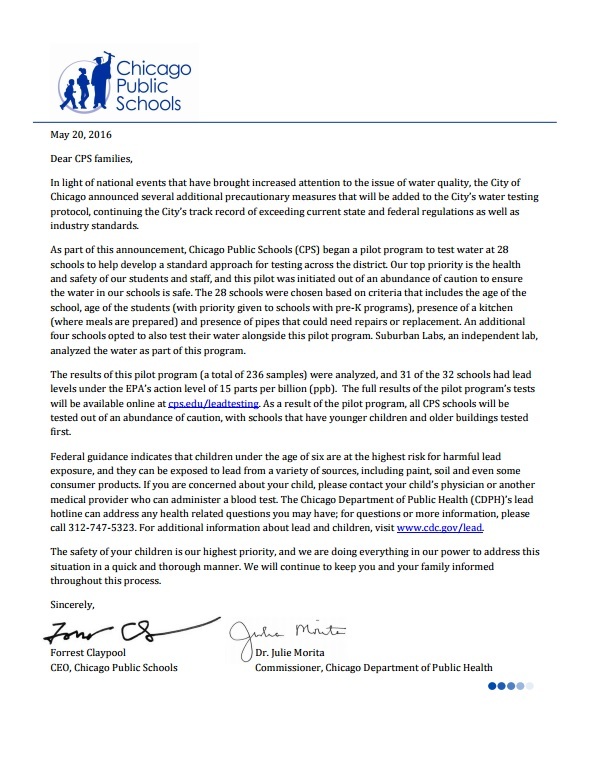 As part of this announcement, Chicago Public Schools (CPS) began a pilot program to test water at 28 schools to help develop a standard approach for testing across the district. Our top priority is the health and safety of our students and staff, and this pilot was initiated out of an abundance of caution to ensure the water in our schools is safe. The 28 schools were chosen based on criteria that includes the age of the school, age of the students (with priority given to schools with pre-K programs), presence of a kitchen (where meals are prepared) and presence of pipes that could need repairs or replacement. An additional four schools opted to also test their water alongside this pilot program. Suburban Labs, an independent lab, analyzed the water as part of this program. The results of this pilot program (a total of 236 samples) were analyzed, and 31 of the 32 schools had lead levels under the EPA’s action level of 15 parts per billion (ppb). The full results of the pilot program’s tests will be available online at cps.edu/leadtesting. As a result of the pilot program, all CPS schools will be tested out of an abundance of caution, with schools that have younger children and older buildings tested first. Federal guidance indicates that children under the age of six are at the highest risk for harmful lead exposure, and they can be exposed to lead from a variety of sources, including paint, soil and even some consumer products. If you are concerned about your child, please contact your child’s physician or another medical provider who can administer a blood test. The Chicago Department of Public Health (CDPH)’s lead hotline can address any health related questions you may have; for questions or more information, please call 312-747-5323. For additional information about lead and children, visit www.cdc.gov/lead. The safety of your children is our highest priority, and we are doing everything in our power to address this situation in a quick and thorough manner. We will continue to keep you and your family informed throughout this process.